Before WWII, there were 23 golf courses in Japan; in 2004, there were over 3,000. In addition to courses, golf ranges, as seen above, are also prevalent. Seen as a status symbol, membership at exclusive golf country clubs reached close to $4 million during Japan's "bubble economy" of the 1980s before decreasing during the following years. Students may want to discuss the dramatic increase in number of courses and exorbitant membership cost in relation to Japan's postwar "economic miracle." Additionally, the constraints of Japan's mountainous geography and high environmental impact of golf courses touch on Japan's seemingly contradictory attitude toward nature. 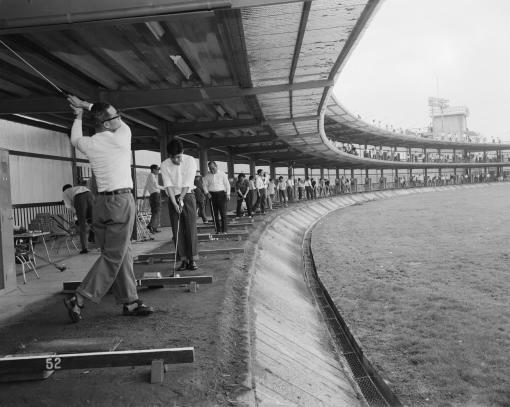 Original caption: The three-storied golf range in the central Tokyo has a total capacity of 155, and 800 to 1,000 golfers do exercise per day. The second floor was added in December of 1959 and the third one completed in March this year. Playing fee is set at Y200 (55$) for dozens of balls, and clubs for rent also available at Y100 (28$). The range is located near Tokyo Tower with a total space of about 52,000 sq. yard. Date photographed: June 08, 1963.